Lausanne is a Primary Years Programme (PYP) school. 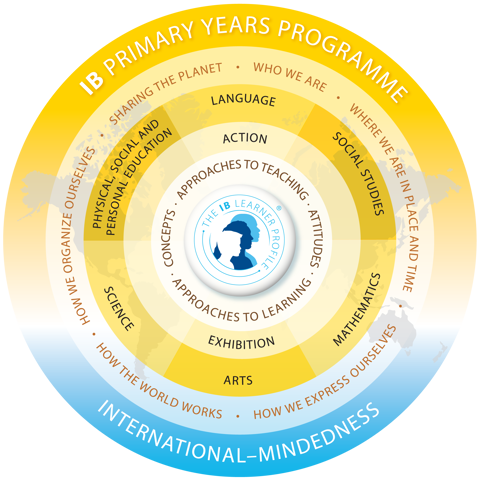 The IB Primary Years Programme (PYP) is an inquiry-based program at Lausanne for students in PreKindergarten through 4th Grade. It focuses on the development of the whole child as an inquirer in both the classroom and in the world outside, helping them grow socially, emotionally, and academically. We also help them explore the world outside of their experience. They become aware of other cultures and peoples, exploring their common humanity while appreciating their differences—all with the goal of creating a better, more peaceful world. Below you'll find descriptions of the unique programs you will find within Lausanne Collegiate School’s Lower School. As an International Baccalaureate Primary Years Programme school, we are focused on creating a joyful and challenging learning environment; encouraging individualism; providing opportunities to succeed; embracing global mindedness; forging meaningful relationships; building character through kindness, cooperation and sharing; and empowering individuals to seek their own journeys. To learn more about the Lower School experience and education The Lausanne Way, please schedule a tour of the Lower School and conversation with the Head of Lower School, Kara Barbour, by e-mailing admission@lausanneschool.com or calling 901.474.1030. Our Early Childhood program provides a curriculum designed to advance the cognitive, language, emotional and motor skills of each child. The daily routine includes a balance of teacher-initiated and child-directed activities in a nurturing environment. Teachers facilitate the growth of independent decision-making, problem-solving and conflict resolution skills while encouraging children’s independent personalities and interests. Integrated project work using teaching strategies that guide children through in-depth studies of real world topics is the foundation of our Early Childhood curriculum. Teachers and children apply all of the classic learning processes while researching a particular subject like bees, rocks or bicycles. Projects have a complex but flexible structural framework with features that characterize the teaching-learning interaction. Lessons may include building a honey comb, visiting with a geologist or taking a field trip to a bike shop. Throughout the project, children are highly motivated, feel actively involved in their own learning and produce high quality work. The Everyday Math program is a comprehensive Lower School math curriculum that emphasizes conceptual understanding and an early introduction to the six major mathematical content areas: number sense, algebra, measurement, geometry, data analysis and probability. The program is based on how students learn and what they’re interested in while preparing them for future mathematical needs. The Everyday Math program is different from traditional, textbook-centered instruction in that the content is taught in a repeated fashion. Concepts are not taught once, tested and forgotten. Throughout the year, students are exposed to concepts from every chapter taught. Lausanne's Lower School Curriculum includes daily study of Mandarin and Spanish. Daily foreign language instruction reflects the vision of the national standards of foreign language learning stated in the “5 C’s” by ACTFL (American Council on Teaching of Foreign Language): Communication, Culture, Connections, Comparisons, and Communities. It also exemplifies Lausanne’s ongoing response to globalization, interaction among different countries and exposure/knowledge in different cultures. Lower School Mandarin classes include basic vocabulary, popular children’s songs, speaking/conversation exercises and other activities to enable the students to build a solid foundation in speaking, reading and writing in Mandarin. By the time they reach 4th grade, students are able to carry short day-to-day conversations, read basic Mandarin, construct short sentences and write short journals. The Lower School Spanish program centers on project-based, culturally-relevant learning and creates the incentive as well as the necessity to use the language to communicate. Differentiated instruction addresses a variety of learning styles and developing levels of proficiency, ranging from novice to native speakers. Our program provides numerous opportunities for students to develop listening comprehension; reading writing and speaking skills; a deepened cultural understanding and expansion of the skills and interest necessary to continue fruitful studies of the Spanish language. Lausanne Lower School students are exposed to art, music and physical activity on a daily basis. This includes rotation through discipline specific music, art and physical education classes throughout the week. The Orff-Schulwerk process for music instruction emphasizes a total music learning experience that uses multiple ways of expressing and creating music. Children learn rhythm, melody, harmony, form and timbre while playing various instruments and, when the opportunity presents itself, creating music through song, instrument playing, dance/movement and games. The philosophy of the Lausanne Lower School art room is based on observations, exploration and manipulations of ideas and materials. Learning to think through exploration rather than imitation allows the student to plan, decide and execute a project; the process of learning the techniques and various materials with an independent spirit encourages decision making skills. Balancing intuitive and analogical functions prepares the student to be confident in their personal choices and plans for future living. Lower School Physical Education focuses on the development of children in a loving, nurturing environment. Through activities focused on movement, cooperative learning and a sports-based curriculum, children develop personal and physical growth. The Spark curriculum is used throughout Lower School Physical Education to help promote lifelong wellness. The importance of character, sportsmanship, teamwork and cooperation are stressed throughout all activities. Lessons are focused on doing one's best. In following The Lausanne Way, we create a joyful and challenging learning process that will not only prepare students to be competitive and cooperative today but for a life within the global community. The Elementary Science Program at Lausanne promotes exciting hands-on learning with an emphasis on discovery. Our lab-based curriculum draws from the general science disciplines of physical, life and earth/space sciences. Students are provided with ample materials, guided instruction and copious encouragement. Each child is taught to record data and other lab results in his or her lab notebook. Scientists who have made historical contributions are referenced. Their stories are told. Curiosity is gently nurtured and cherished. To learn more, visit our lower school Science website: http://www.lausannescience.com/. Students in grades 1-4 have scheduled time in the lab twice during the seven day rotation. Students in grades PK, JK, and SK receive visits from the science teacher as needed to enhance the projects going on within the grade. Reader's Workshop is a block of time during the school day that teaches students to read and comprehend books in a manner that is consistent with how they will read and comprehend as adults. It focuses on exposure to a variety of reading genres and comprehension strategies while utilizing real-world student driven instruction. The Reader's Workshop method blends whole group instruction, small needs-based groups and individual conferring to guide students through the application of basic comprehension strategies. A typical Reader's Workshop format includes a mini-lesson, independent reading, guided reading, conferencing with a teacher and vocabulary study. Each Reader's Workshop ends with a sharing time in which students discuss what they’ve learned about being a reader that day. Writer’s Workshop is a block of time during the school day in which students are able to develop attitudes and habits that will enable them to use literacy as a tool for lifelong learning. A typical Writer’s Workshop format includes a mini-lesson focusing on a particular writing skill (including grammar), independent writing time, teacher conferencing and finally group/partner share time. This format allows students to see many writing pieces through the writing process from brainstorming to publishing. It also enables the teacher to differentiate their writing instruction based on students’ strengths and challenges. Project work is a daily block of engaged learning time for lower school students at Lausanne. This science and social studies focused curriculum component is broken up into three-four learning units throughout the year. Each student rotates to all teachers within the grade throughout the different units. By doing so, students are given the opportunity to work in different groups with a variety of peers to solve problems and create projects to demonstrate applied learning. Project work allows students the real-world life experience of working with others. During the year, students gain essential life tools while utilizing creativity and technology to learn core curriculum concepts. Lower School ANTS classes strive to help students think like “makers”. Students have been working individually and collaboratively to plan, design, sketch, and build different structures from various materials, including uncooked spaghetti, tape, index cards, card board, tape, apple slices, toothpicks, and marshmallows! They have shown an impressive amount of perseverance, even when structures fail, walls crumble, or ideas simply do not turn out the way they envisioned. In coming months, students will be invited to come build in the Makerspace, as well as use technology, such as laptops and tablets, to enhance their learning.